Today’s conventional car has features most of us take for granted. Things such as satellite navigation and self-parking were movie effects or radical theories a couple of decades ago. If autonomous cars go mainstream what will our grandkids drive 20-30 years from now, space ships? Here are 10 of the smartest car technologies that will blow you away. We sure love the idea of making a car’s internal combustion engine a bit more efficient. In fact, many attempts have been made to advance the technology and make EVs consume less. Recently, Cadillac has been focusing a lot of air propulsion, and they have already revealed Cadillac Aera. The concept won the Auto Show Design Challenge in L.A; the magnificent style of the vehicle led to a hypothetical number of 1,000 miles on compressed air prior to the refueling process. Although there’s nothing wrong with today’s spectacular CTS-Vs, we would love to get behind the wheel of a Cadillac Aera. For this to happen, we may have to wait another 20 years. Another smart technology that will knock your socks off comes from the runner up of the Auto Show Design Challenge in L.A, the concept car known as Smart 454 WWT (aka weight watch technology). Even though carbon fiber is not something new, Smart’s aim is to make it more affordable. The company’s concept vehicle has interchangeable body panels that are supposed to reconfigure the vehicle based on the preferences of the driver. The technology has great chances of materializing if Smart manages to surpass crash testing. Experts agree that tomorrow’s electric car will have more than one motor. Rumor has it that there will be one motor attached to each car wheel. Jaguar’s concept vehicle, the C-X75, already has this feature. However, Nissan’s iV is even better if we look beyond the ivy composite and spider silk body. Nissan has a patent for the technology, and apparently it can also handle suspension duties and steering. We cannot expect for the automaker to make the magnetic drive system a reality. 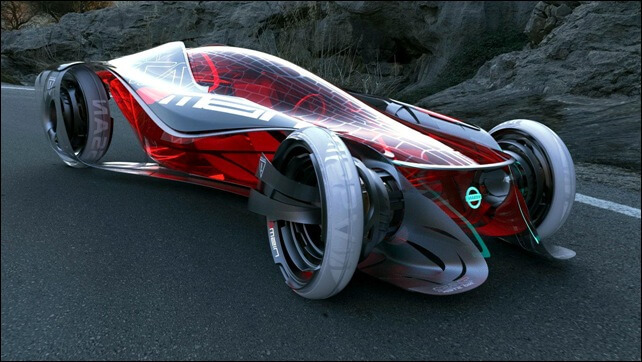 According to Nissan, the technology has great chances of becoming plausible by 2035. That’s a lot of waiting time, but we’re sure that we won’t be disappointed when it comes out. The auto industry is packed with peculiar, pairing and odd combinations that somehow have great potential and seem to work pretty well. Toyota strongly believes that, and therefore they’re developed Nori, which means seaweed in Japanese. For the making of this smart car technology, Toyota has created a carbon fiber chassis/body, but they’ve added seaweed in the mix. They’re also implemented solar panels to make the concept car energy-efficient. The combined chassis and body is unbelievably light and strong. By adding soar cells the vehicle generates supplemental power. We would love to breathe fresher air and not have to inhale polluted air from all the cars on the streets. Sadly, that’s not possible just yet. An upcoming smart car technology comes from Mercedes Biome, and it’s really cool to say the least. It doesn’t have any nasty emissions and it aims at creating pure oxygen emissions. Can you believe that by 2050 the car we will drive might emit pure oxygen? There’s nothing wrong with hoping that someday the technology will become a reality, so let’s dream on! The supercar concept recently released by Jaguar with its C-X75 model is mind-blowing. The vehicle features a revolutionary design, and it also packs superb technicals. Each wheel has its own motor that draws energy from a central lithium-ion battery. The party pieces of the C-X75 are gas turbines, and Jaguar claims that the car concept blasts from 0 to 60 mph in 3.4 seconds. However, because the turbines are positioned behind the car, they must find a way to stop the heat from meting vehicles positioned behind Jaguar C-X75 on the street. If they can make that happen, we’ll see this technology materialize by 2025. A car’s organic design has just reached a whole new level. Even though Honda’s Air car concept is not the only one, the fact that the vehicle features veggie-based body panels sure makes the concept interesting. A major benefit would also be reduced weight, particularly when mixed with additional weight-saving features such as glass-reinforced seat panels and urethane tires. The idea of developing a car with pulling rickshaws seems rather far-fetched. The latest Maybach DRS concept looks like an urban sombrero with an edge. It is a beautiful blend of a personal city car and a coffin. Yes, a coffin! But leaving aside the weird design of this car, it certainly packs smart tech advances we’d love to see in average vehicles. According to Maybach, we might have to wait another 50 years to that to happen. Kia strikes again with a concept car known as Kia Pop. Based on OLED technology, which by the way is insanely expensive, the vehicle takes a brand new approach to car dashboards with translucent panels. Basically, Kia Pop will provide improved vision than other car dashboards. It’s a type of technology that is first displayed on halo models; afterwards, it becomes mass-produced and included in compact cars and sedans. Considering OLED technology is improving fast, we should expect new vehicles to incorporate it by the end of 2015. Building on existing voice control and knob technology, Audi introduced in 2011 an in-car feature that would offer unparalleled control ease of their cars. But since technology likes to advance with every year that goes by, the automaker’s new system is known as MMI touch (multi-media interface touch). The new technology allows drivers to input characters with a finger to “write” directly on the car’s touchpad. A range of apps will be triggered, and the whole purpose of the system is to ease the driving experience.